Buying books is very therapeutic to me. Some people prefer splurging their money on new shoes and clothes, while I like to spend my money buying the stories on print. I buy books even if I am not sure if I have the time to read them. Sometimes, I also judge a book by its cover before buying it. Currently, my to-read list keeps piling up because I keep buying books, especially now that I just bought more books from this year’s Manila International Book Fair. 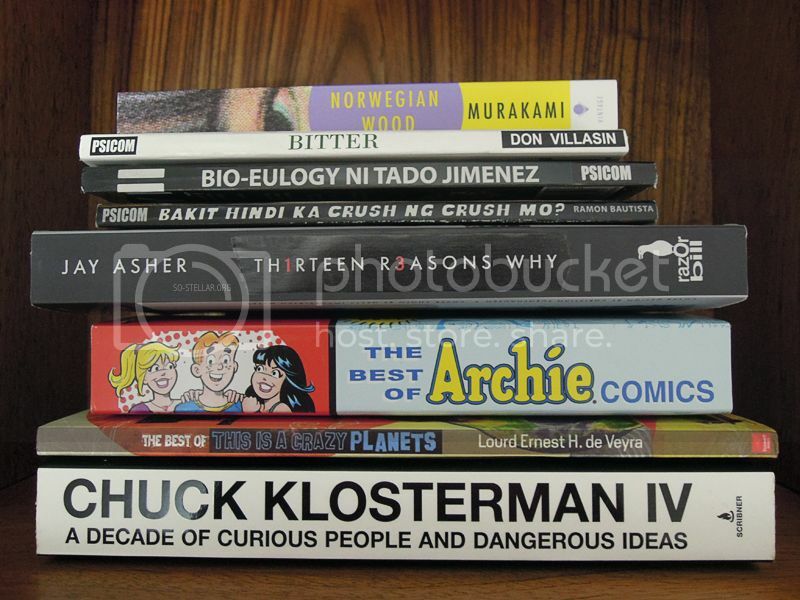 I found Klosterman’s “IV” book at MOA’s Fully Booked store, not in their MIBF booth. Good thing I decided to take a glance at their sale pile before my friend and I left the pile. From P500+ to P100, score! I did my research and there are two more books from him that I would like to buy.. haha, here we go again with #bookhoarding. In my last post, I was firm on my decision that I shall only buy books from local authors in our visit this Saturday. As you can see, I broke my own decision, and I went home with a couple more books but not all of them are from local authors. But overall, my 2nd 3rd time in the MIBF was very satisfying compared to the previou(s) ones I went to. 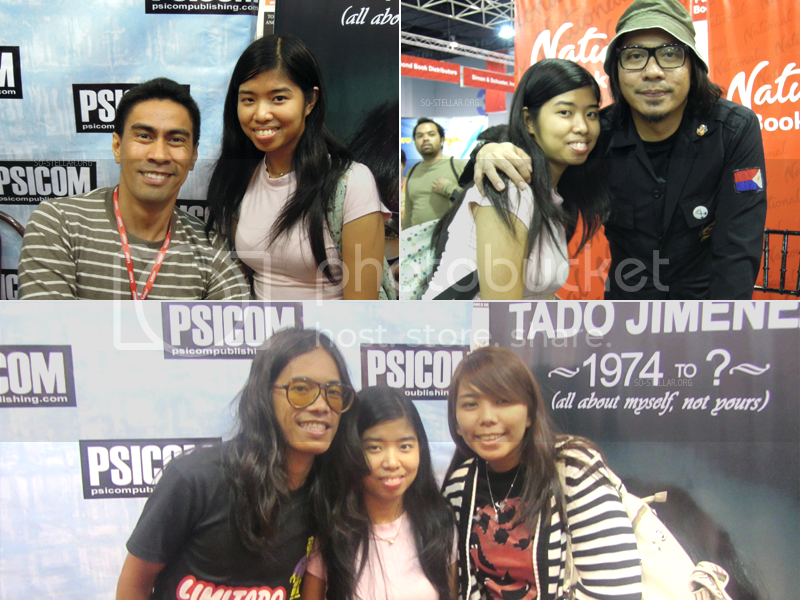 Okay, I just remembered that in 2009, I also went to the 30st MIBF. 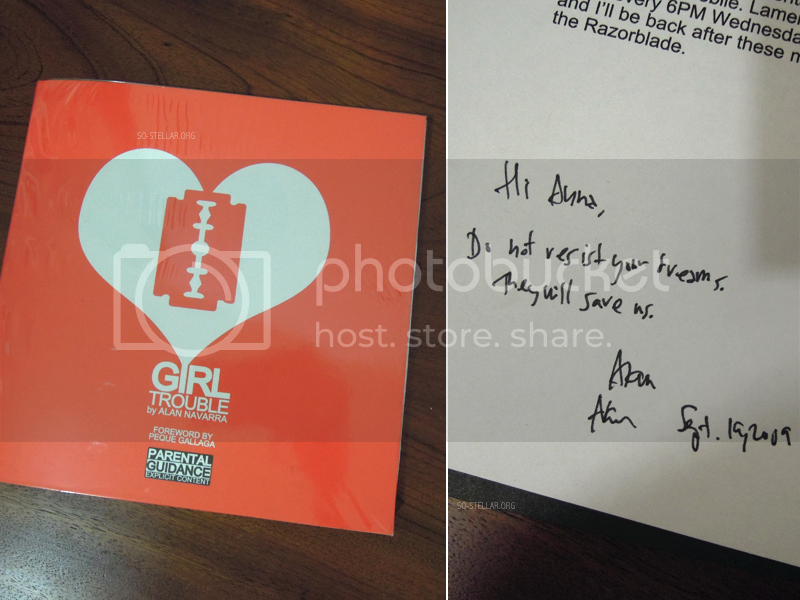 I found this book by Alan Navarra in my shelf while I was sorting my books, and the memory rushed to my head. I had this book signed by him. I hoped to see their booth too, but when I looked at the list of participating publishers, they (VISPRINT) weren’t there. I bought the book for the pretty text layout and graphic design shiz. Thought the book can serve as my inspiration for typography book. I haven’t opened it since then, actually. I also got to meet the authors of some of the books that I bought. What I like about meeting authors is that they’re low-key and much easier to approach, oh and the random messages they write on your book is my favorite part! 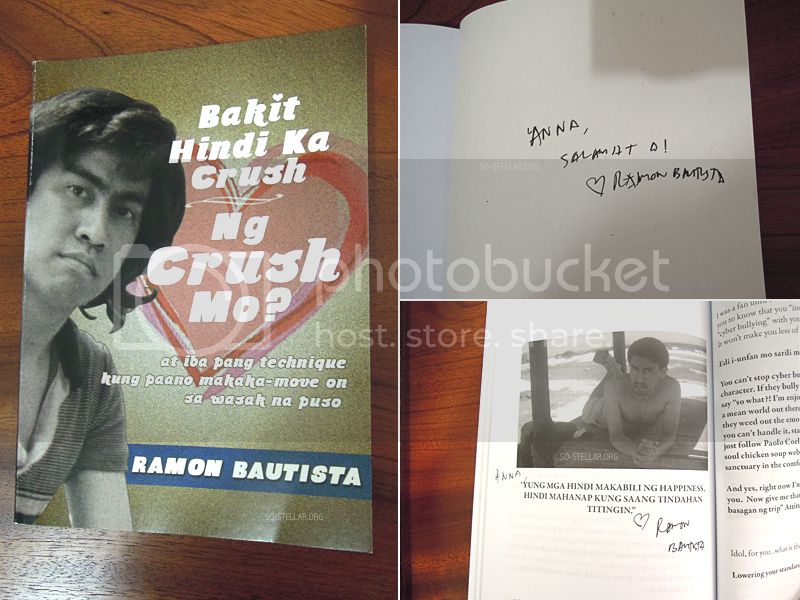 Ramon Bautista is completely a different story, though. Not only is he already well-known online and in local pop culture, but the line for his book signing is so long that we had to wait in line for TWO hours before we got our turn. His queue was probably the longest out of all the authors who held a book signing event at MIBF. No regrets, hahahaha. We took a break after we shopped at FB, NBS, finished the book signing of Tado and Lourd De Veyra in the afternoon to have lunch and catch up with friends. This was before RB’s book signing. Imagine, we went back to the MIBF around 4PM already and the line was still super long. Haha. 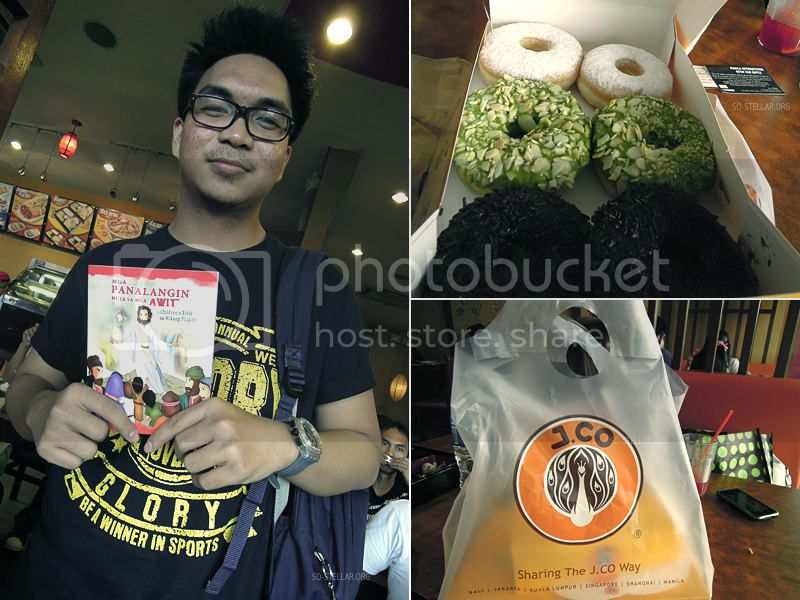 Yummy nomnom lunch at Yoshinoya and @clang_sy bought us J.Co donuts because I have never tried them. @DrewrZ gave us copies of his first published children’s book, and signed it too. PS: J.Co donuts are damn tasty. If only I have the time and patience to wait in line, I would rush there right now to buy me a box of 6. I’ll give it 3-6 months for the hype to die down. Next year, I intend to come at the bookfair on a weekday to take advantage of a peaceful MIBF experience. Also, to find the booths of Visprint (hoping they’ll join next year!) 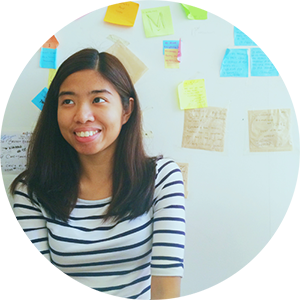 and PHR (hahahahaha, just to see what the big deal is with their P30 books). This time, I didn’t find the Scientology booth. Oh well. I was much busier this year than last year.